Rock Burger's second location is a big success in Niagara Falls. NIAGARA FALLS, N.Y. (WKBW) — Rock Burger's newest location is a sizzling sensation. Famous for it's stuffed burgers with everything from candy bars to bacon bits, owner Jason Lizardo could have opened his second location anywhere. He chose the intersection of Niagara Falls Boulevard and Military Road because he said Niagara Falls has a lot of potential. "There's a lot of misunderstanding about Niagara Falls. People think it's lower class and things like that. There's a lot of people out there that have ideas that can make it their own if they chose to and expand into a big dream," Jason Lizardo, owner of Rock Burger, said. Lizardo already has a location by the Falls. He says it can get so busy during the summer customers can wait up to 2 hours. That's why he opened up this second restaurant - away from the tourists - specifically for the locals. "This is to give back to Niagara Falls," Lizardo said. One week into its new location, business is better than ever. 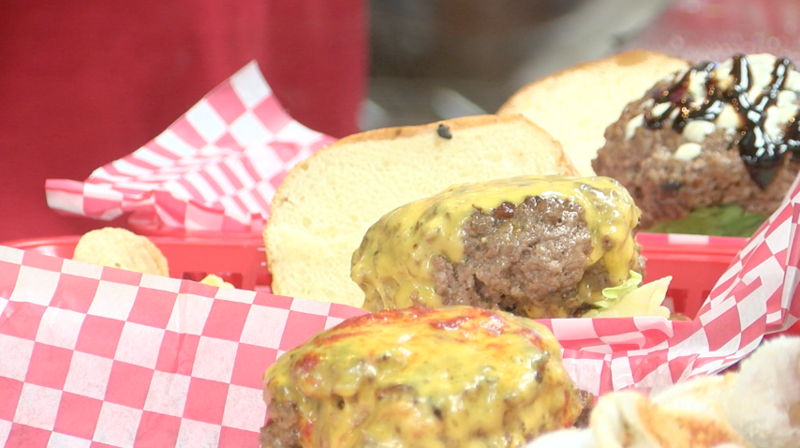 Rock Burger is serving more than 400 meals a day. "I have slept about only two hours a night. We are here 15 hours a day," he said. The new location also features an expanded menu with items like salads and hot dogs. Rock Burger has plans on future expansion. Not only is it eyeing the rest of Western New York, Lizardo is playing with the idea of franchising the restaurant in cities as far away as San Francisco.